In a person-centred health system the ability to connect services, applications and systems is essential for allowing patients to be cared for by the right clinician, at the right time and place, providing access to their records electronically with the confidence that information is kept secure at all stages. The Connected Health programme is a key step in achieving this aim. Its purpose is to establish the secure environment needed for the safe sharing of health information between all the participating health providers. Connectivity standards are a foundation component of Connected Health. HISO 10037.1:2010 Connected Health Architectural Framework (this page) – a technical architecture for a closed community of computer networks creating one secure network for health, that is, a network of (private) networks. HISO 10037.2:2010 Connected Health Network to Network Interface Specifications – provides the technical details needed for component private networks to interconnect with other private networks within the health sector’s closed community. HISO 10037.3:2015 Connected Health User to Network Interface Specifications – describes the way in which end users, such as GPs, district health board staff and pharmacists connect equipment to the Connected Health network. Ministry of Health. 2010. 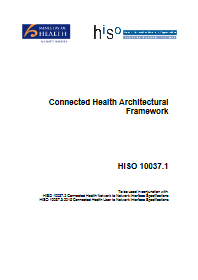 HISO 10037.1:2010 Connected Health Architectural Framework. Wellington: Ministry of Health. Owned by the Ministry of Health and licensed for reuse under a Creative Commons Attribution 4.0 International Licence.